A new multi-tower mixed use development has been submitted by Wentworth Equities for 19 Hercules Street, Hamilton. The site previously had a DA for a 23 storey building and 582 apartments known as ‘Foreshore Hamilton’ by Mirvac, however the site has since been sold to Wentworth Equities. 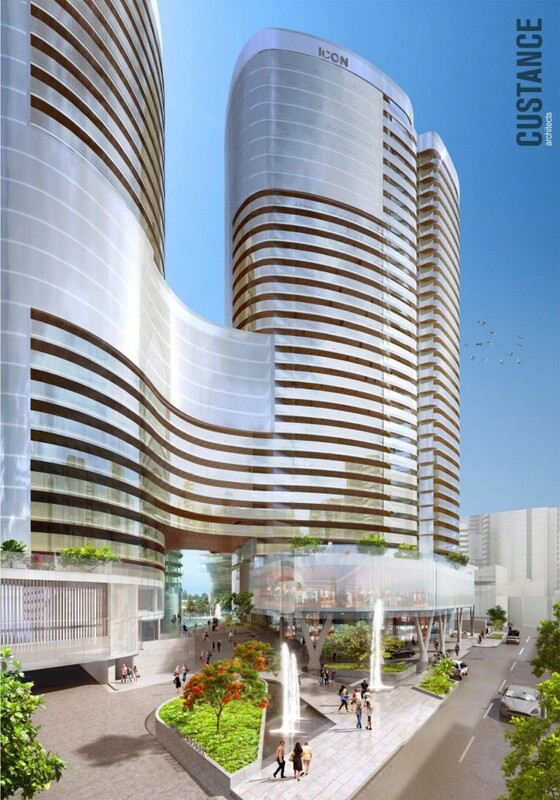 The new proposal has been designed by architecture firm Custance and comprises three residential towers and one 5 star hotel tower rising from a pedestrian retail plaza known as Hamilton Place. A total of 59,406m2 of gross floor area is proposed. The proposed development contains a diverse mix of building heights, apartment types and uses. A 34 storey building (measured from Main Street) which is RL 108.25m AHD in height. This tower comprises a 5 star hotel up to level 15, with the balance of the building comprising residential apartments. The hotel component comprises 13,178m2 and includes 227 hotel rooms as well as associated lobby, cocktail lounge, function room, restaurant and fitness centre components. Above the hotel are 229 apartments, comprising 174 studio and one bedroom apartments, 48 two bedroom apartments and 7 three bedroom apartments. A 31 storey building (measured from Main Street) which is RL 97m AHD to the top of the plant level. This tower comprises 127 residential apartments, which is made up of 51 one bedroom apartments, 74 two bedroom apartments and 2 three bedroom apartments. A link connects towers 1 and 2 between levels 6-16. This component of the development comprises 20 three bedroom apartments. An 11 storey building (measured from Hercules Street) which is RL 36.1m AHD to the top of the plant level. This tower comprises 26 residential apartments, which is made up of 19 one bedroom apartments, 6 two bedroom apartments and 1 three bedroom apartment. An 18 storey building (measured from Hercules Street) which is RL 57.7m AHD to the top of the plant level. This tower comprises 158 residential apartments, which is made up of 108 studio and one bedroom apartments, 49 two bedroom apartments and 1 three bedroom apartment. The proposed residential apartments and hotel are supported at the lower level by a range of active uses. Two anchor retail tenancies are provided at the Hercules Street level which is complemented by a series of retail tenancies at the Main Street level which front the plaza. The nature of the retail tenancies proposed will complement and add to the existing retail offer within the Portside precinct. At the podium level, the proposal comprises a gym and child care centre (75 children) which complement the retail offering at the lower levels and further contributes to the activation of the site and wider precinct. 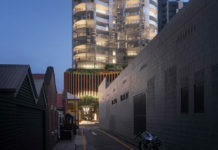 The landscape response to the development site is to create a landmark experience that is unique to Brisbane and that is defined by its distinctive interpretation of a contemporary urban landscape. In a position where connectivity is paramount, the landscape concept delivers an exciting and memorable axis through the site, linking the river to the park. The development includes 2670m2 of public realm, representing 35% of the site area. The public realm concept is strongly based around the theme of bringing the Park into the site from the north and alternatively bringing the river into the site from the south. This has resulted in civic space that provokes a deep-felt sense of engagement that will trigger activity within and to the broader precincts of Northshore Hamilton. Hamilton Place’s sculpted ground plane of ponds and water features, its unique combination of high quality materials and finishes and its quintessential sub-tropical planting palette will bring a sense of place and identity to the development. The DA number for this development is (#DEV2014/592).